Are you concerned about your teen’s rising anxiety level? Some anxiety is healthy, but today’s teens are overwhelmed with stress from peer pressure, busy schedules, cell phones, relationships and social media. Thankfully relief may be closer than you think. Did you know reading the Bible helps your teen both spiritually and physically? Discover how reading God’s word can calm your anxious teen. Reading is scientifically proven to slow heart rate and ease muscle tension. It is one of the best (and most fun) ways to reduce stress so make sure they have a Bible with special features for teens within reach. Reading allows teens to focus on something outside of their worries. When they are actively engaging with words and stories, their thoughts drift from their troubles, giving them a much-needed break. The world is filled with difficult questions and the Bible has relevant answers, even in todays’ culture. Who is Jesus? Why am I here? What does God say about relationships? What should I do with my feelings of temptation? It’s all found in the Bible. Reading and critical thinking sparks questions. Be ready to chat about their discoveries from the Bible. There is no better guidebook to prayer than the Bible. The Bible teaches us when to pray (continually), who to pray for (everyone including enemies), how to pray (joyful and patiently), and why to pray (God calls us to pray). From the Scriptures, we read examples of those in prayer including Jazeb, Jonah, Hannah, David, Jesus, and Paul. We also learn that God always hears us and always answers us. Everyday your teen is faced with many choices. The more time they spend in Scripture, the faster they will see the right decision. Teens are programed with a certain level of expectations about how their lives should work and what their parents will provide for them. When these expectations fail to align with reality, they can feel let down. But in the Bible, we learn that our expectations should be in God, not in other people our ourselves. Those who trust in Jesus can expect good things in life. Between school, homework, sports and friends, it can feel like there aren’t enough hours in the day. The Bible helps us set our priorities in order as we grow in our faith. When you’re looking for the next birthday, graduation, Christmas, or “just because” gift, reach for a special Bible for your teen. For 15 years, the best-selling NIV True Images Bible and NIV Revolution Bible have been a trusted resource. 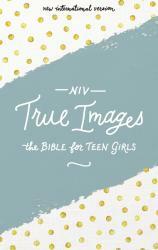 Recently revised, these Bibles are focused on the specific issues teens deal with today. Updated for this generation, this new edition is packed with tools and insight to help teens navigate today’s contemporary cultural issues with confidence, love, and grace. Thank you Peter, for that important insight. I am a parent whose child needed professional help and thank God we finally received it after years of hurts and pains.